The importance of streamlining was known very early in the 20th century. Some streamlining was seen on racing motorcycles as early as the 1920s. The effects of aerodynamic drag on motorcycles are very significant. The term fairing came into use in aircraft aerodynamics with regard to smoothing airflow over a juncture of components where airflow was disrupted. Early streamlining was often unsuccessful resulting in instability. Handlebar fairings, such as those on Harley-Davidson Tourers, sometimes upset the balance of a motorcycle, inducing wobble. The introduction on the BMW R100RS in 1976 marked the beginning of widespread adoption of fairings on sports and touring types of motorcycles. 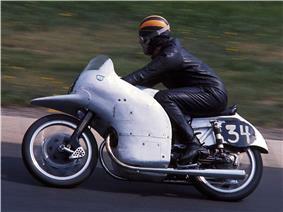 Originally the fairings were cowlings put around the front of the bike, increasing its frontal area. Gradually they had become an integral part of the design. Modern fairings increase the frontal area at most by 5% compared to a naked machine. Fairing may carry headlights, instruments, and other items. If the fairing is mounted on the frame, mounting equipment on the fairing reduces the weight and rotational inertia of the steering assembly, improving the handling. 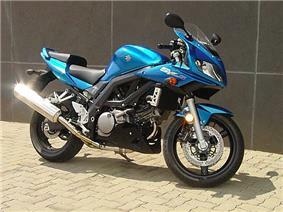 Suzuki SV650s with half fairing and an aftermarket belly pan. Streamliner: This is a full fairing as found on land speed record machines. 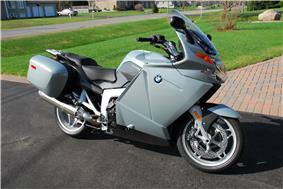 The entire body of the motorcycle is covered to provide the lowest drag coefficient ratio attainable. The NSU Delphin III (Dolphin III) is a streamliner. Dustbin fairing: A single-piece, streamlined shell covering the front half of a motorcycle resembling the nose of an aircraft, sometimes referred to as torpedo fairing. It dramatically reduced the frontal drag, but it was banned by Fédération Internationale de Motocyclisme (FIM) from racing in 1958, because it was thought that the frontal point of wind pressure made them highly unstable even with small amounts of yaw. Other reasons cited for the ban were to ensure adequate steering range (lock-to-lock) and stability against crosswinds. FIM regulations forbid streamlining beyond the wheel spindles and require the rider's arms and legs to be visible from the side. Dolphin fairing: This was called so because, in early models, the front wheel mud guard streamlined with the rising windshield part of the fairing resembled the dolphin's beak from the side view. Further developments on this design became the norm after the ban of the dustbins. Full-fairing: Bodywork that covers both upper and lower portions of the motorcycle, as distinct from a half fairing, which only has an upper section, and the lower half of the motorcycle is exposed. The fairing on a race or sport bike is meant as an aerodynamic aid, so the windscreen is rarely looked through. If the rider is sitting up at speed he will be buffeted by his rapid progress through the air and act as a parachute, slowing the bike, while if the rider lies flat on the tank behind the windscreen he generates much less aerodynamic drag. The high windscreen and handle-bar width of a touring fairing protect the upright rider from the worst of this, and the windscreen is functional. Full fairings can also provide protection to the engine and chassis in the event of a crash where the fairings, rather than the engine covers and/or frame, slide on the road. Half-fairing: Fairing that features a windscreen and fairing extending at least below the handlebars, even as far as down to the sides of the cylinder block, though generally half-fairing doesn't cover the sides of the crankcase or gear box. A number of half-faired models have aftermarket kits available to extend the original half-fairing into a full fairing. Due to the popularity of these kits some manufacturers have started to supply their own full-fairing conversion kits and even offer their half-faired models new with a full-fairing kit fitted at the factory. 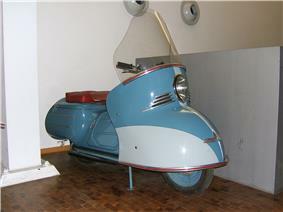 Quarter fairing: A windscreen and minimal fairing extending around the headlight fixed to the triple clamp; also referred to as a "bikini fairing". Belly pan: Quarter and half fairings are often paired with a belly pan below the engine for diverting air flow away from under the engine to reduce aerodynamic lift, as well as cosmetic reasons. Some track day or racing rules require belly pans to catch leaked fluids. Acrylonitrile butadiene styrene (ABS) plastic is commonly used in original equipment sport bikes and certain aftermarket fairing manufacturers due to its strong, flexible and light weight properties. The advantage of ABS over other plastics is that it combines the strength and rigidity of acrylonitrile and styrene with the toughness of polybutadiene rubber. The proportions of each property vary based on the targeted result. There are two common methods of producing an ABS plastic fairing: injection and compression molding. Injection molding: ABS plastic is melted and injected into mold cavity. Constant pressure is applied to allow for material shrinkage. The plastic then cools and hardens in the mold. Injection molds allows for uniform thickness throughout the entire piece. It gives the most accurate end product that fits well. Compression molding: The plastic is generally preheated is placed into a heated metal mold cavity and pressure is applied to force the plastic to contract and take the shape of the mold. Heat and pressure is kept until the plastic cures the mold. The excess plastic is cut away and removed from the mold. Disadvantages to compression mold include varying product consistency and flashing, which is excess material attached to the molded part that needs to be removed where two or more parts of the mold meet. Fiberglass is made of woven fibers, and is used as a reinforcing agent for many polymer products. The composite properly known as glass-reinforced plastic (GRP), is normally referred to by the name of its reinforcing material. Fiberglass fairings are commonly used on the race track. In most cases fiberglass is lighter, and more durable than ABS Plastic. Damaged fiberglass can be repaired by applying new layers of woven fiberglass cloth mixed with a polymer such as epoxy over the damaged area, followed by sanding and finishing. Carbon-fiber-reinforced polymer is the lightest, but most expensive, fairing material. It is used on the most extreme sport and racing motorcycle fairings. ^ Tony Foale, Motorcycle Handling and Chassis Design, ISBN 84-933286-3-4 , Chapter 5: "Aerodynamics"
^ Obradovich, George (August 29, 2008). "2009 Harley-Davidson Electra Glide Standard Review". 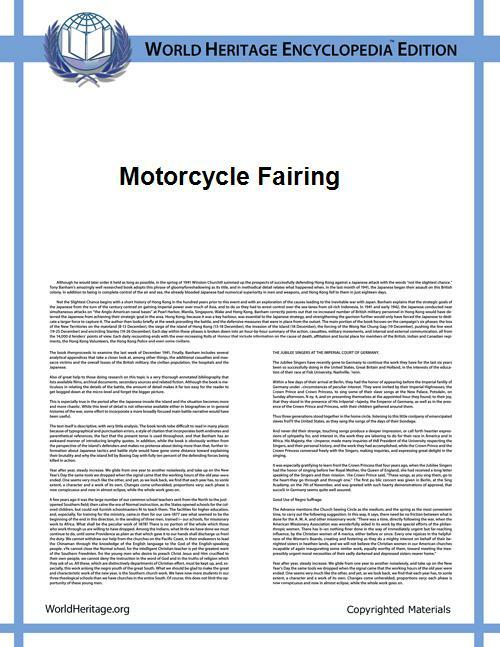 Motorcycle.com. VerticalScope. Archived from the original on 2013-09-15. Retrieved 2014-09-21. ^ Tong, David (2012) . "Sport-Touring Defined: The BMW RS Series". chuckhawks.com. Chuck Hawks. Archived from the original on 2014-02-09.